Hawkesbury Toolworx & Farrier Supplies - Tools, Farrier Supplies & Outdoors - Tools - For an extensive range of tools for all types of tradesmen and all your farrier and outdoor supplies. Hawkesbury Toolworx has an extensive range of tools for all types of tradesmen, from builders and bricklayers to concreters, plumbers, painters and carpenters. As a builder in the Hawkesbury for 33 years, Rob knows quality tools when he sees them, and makes sure each product is tried and tested before it becomes a stock line. 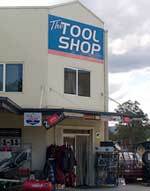 Hawkesbury Toolworx also specialises in sourcing and importing those hard-to-find tools from Europe and America. Give Hawkesbury Toolworx a call today on 4571 3890.